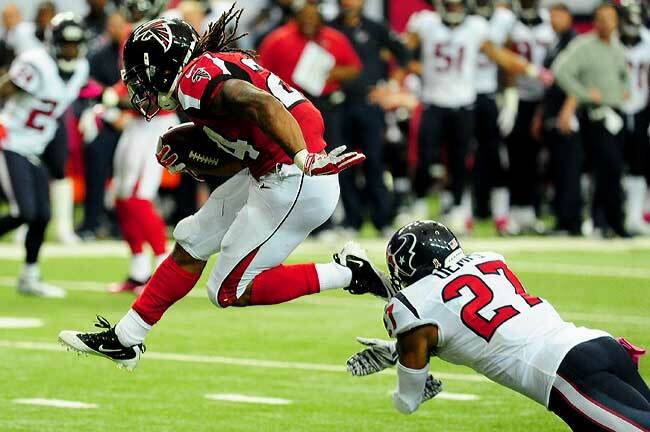 Atlanta Falcons running back Devonta Freeman. FLOWERY BRANCH, Ga. — Entering tonight’s game at New Orleans, it’s amazing how much the Atlanta Falcons’ breakout star, second-year running back Devonta Freeman, mirrors his overachieving 5-0 team. Consider the Falcons’ running back ranks second in the league with 405 rushing yards, despite playing sparingly in the first two weeks. Or that he has more touchdowns (eight) than Adrian Peterson and Jamaal Charles combined. Or, in the Falcons’ 25-19 overtime win against Washington Sunday, the 5-foot-8 and shade-over-200-pound back pinballed for 95 yards outside the tackles on his way to a career-best 153-yard rushing day. But Freeman’s story doesn’t end there. The football part of his life is good enough. The off-field part might be better. After afternoon home games, on Tuesday off-days, and occasionally at the team hotel, Freeman logs onto his laptop and posts 150-word discussion board commentary on the causes, effects and curse of stereotyping and social perception. Freeman contacted Williams during his rookie NFL season, and has taken courses each semester since—including this summer. Freeman figured he managed the workload while he was a student-athlete. Why not now when he has even more time? “I had no idea,” said guard James Stone. Freeman, a 2014 fourth-round pick, backed-up veteran Steven Jackson last season. He inherited the No. 1 role with Jackson’s release in February, but with a hamstring injury in training camp, lost it to Coleman, a rookie. When Coleman got hurt in Week 2, Freeman took over. But no one saw this breakout three weeks coming. Except for a guy who has seen this movie before. In 2009, Florida State coach Jimbo Fisher visited Miami Central High School to scout Brandon Gainer, a hot running back prospect. Gainer wasn’t at practice, instead taking night classes to get in good academic standing. Fisher stayed anyway, and couldn’t take his eyes off the undersized junior blazing through drills. He was the most passionate player on the field. Freeman, at the time, was a zero-star recruit, not even listed on any scouting services. Fisher offered Freeman a scholarship that summer— “everyone thought we were crazy,” Fisher said—and when Freeman broke out for 2,208 yards and 26 touchdowns as a senior, Auburn and Florida and Miami, his childhood dream college, came recruiting. Williams, the academic advisor, initially thought Freeman would be a problem-student because it took her nearly two weeks to get in touch with him when she was first hired. They played phone tag, text-tag, and she figured Freeman might be a flake. Turns out, Freeman was in the training facility, or class—doing exactly what he was supposed to be doing, just didn’t always have his phone handy. In Atlanta, Freeman stays equally busy. On Monday, he asked Quinn if he can do boxing drills, one of his favorite coordination exercises, after practice. He kept a reporter waiting until 6 p.m. on Tuesday—five hours after media availability—because besides the walk-through and position meeting, he also wanted to go in the cold tub, and the hot tub, and get a massage, and meet a coach one more time. When he sat down for an interview, he first apologized, saying he needed to get all his football stuff done first, but was happy to stay as long the reporter needed. He has a gentle voice that matches his boyish face, and a disarming quality; he pulled up a chair two inches from the reporter, and leaned in to speak. As the oldest of seven children, Freeman helped his mother and grandmother as much as he could in Miami’s Liberty City neighborhood. Freeman got his first job at age 12. His longest-standing gig was at the Richardson Funeral Home, where he opened the limo doors for the grieving families and handed out flowers. He was paid $50 per funeral, sometimes working as many as four per day. He played for the Optimist Club Pop Warner team, and was coached by Luther (Uncle Luke) Campbell, of the rap group 2 Live Crew. Campbell mentored Freeman, driving him home from practice, inviting the team over for pool parties and offering advice on how to stay out of trouble. Campbell’s wife, Kristin, now co-represents Freeman. Though Freeman followed their guidance, his heart stayed home. Anytime he got a Pell Grant in college, he sent most of it to his mother and grandmother to help pay bills. At Florida State, he tried to focus solely on football, but that wasn’t always easy. Darling returned to Liberty City in 2012 during Freeman’s sophomore season. The night after the Seminoles’ 52-0 win against Wake Forest, Freeman was awoken by a call from his sister. She was wailing, her words as incoherent as they were incomprehensible. Darling was killed in a gunfight. He was 20. It was the only time teammates ever saw Freeman despondent: not wanting to eat, not wanting to talk, not wanting to practice. The influence of first-year head coach Quinn, the former Seahawks defensive coordinator, is the biggest overarching storyline in the Falcons’ scorching start. The 45-year-old hired a DJ to spin hip-hop at practice, mashes team meetings with YouTube clips (MMA is a favorite), implemented his simplistic but aggressive defensive schemes and stresses urgency—the latter of which was lacking at the end of the Mike Smith era. Of course, Quinn also inherited a sturdy quarterback (Matt Ryan), a rare-breed receiver (Julio Jones) and a strong general manager, Thomas Dimitroff, working in tandem with long-time friend and former Chiefs GM Scott Pioli as his assistant. Together, they have given Freeman the opportunity to succeed. Pro Football Focus ranked the Falcons’ offensive line 30th in 2013 and 26th in 2014. Last season, it was so ravaged by injury that at one point tight end Levine Toiolo lined up at right tackle. With new offensive coordinator Kyle Shanahan implementing a zone-blocking scheme, the Falcons shifted pieces all offseason to figure out what would work. Of Atlanta’s nine offensive linemen, six are new this season and four—Andy Levitre, Gino Gradkowski, Bryce Harris and Jake Long—weren’t even on the roster for the final preseason game. Through five weeks, PFF ranks Atlanta’s offensive line as best in the league. Freeman’s best attributes are his vision, and ability to cut through open holes afforded by zone-blocking and burst his speed from there. Freeman also splits out wide, and has 24 catches for 240 yards. His dual-threat status has taken some pressure off the consistently double-covered Jones. Coleman is now healthy enough to play, and was active in the Washington game, but Quinn plans on going with the hot hand, which for now is obvious. The team loves playing for Quinn because he empowers them. Because it is so easy, perhaps that is why Freeman has time to finish his studies. Others may follow suit. When told of Freeman’s dual life, Coleman, who left Indiana after his junior season, looked as if his interest was piqued. “Maybe I should do that too,” he said.